Summertime here on the east coast and get really hot and not very many people feel like cooking when it's sweltering outside. I like to look for meals that either don't involve cooking or have very little cooking to them. Food prep I don't mind so much, but nobody really wants to turn on the oven when it's in the 90's outside (or hotter). This is where sandwiches come in. They're usually quick and easy to put together with a minimal amount of cooking. 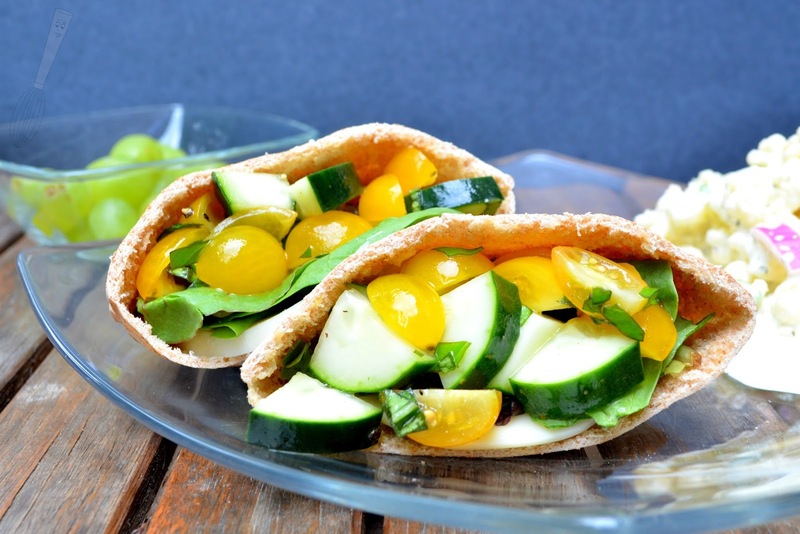 I'm a huge fan of anything to do with pitas for the most part. One of my favorite is pita pizzas but since we're trying not to cook here then I made these delicious pita sandwiches. They're stuffed to the brim with fresh vegetables that are bursting with flavor. I wish I could say that the vegetables were local, but this time around they aren't. This was such a refreshing meal for a humid summer evening. I served it with fresh grapes and some I Can't Believe It's Not Potato Salad. I do love that salad too. I change the salad recipe a bit but this post isn't about the salad, it's about that beautiful pita pocket in the picture. We have fresh basil growing outside and I'm always looking for new uses. The fresh basil blends perfectly, as you would expect, with the tomatoes, cucumbers, red wine vinegar, and olive oil. I like to use the Spanish olive oil from Trader Joe's. I just really like the flavor and density of it, especially in meals like this. Using a fresh mozzarella instead of shredded really makes a difference too. In a pinch you would definitely use the shredded version but a huge ball of fresh mozzarella is perfect for slicing to put in the pita halves. So, take a trip to your local farmer's market and see if you can find some fresh tomatoes, cucumber, and mozzarella cheese for a quick, easy, and cool weeknight (or weekend) meal! Happy Eating everyone! 1. In a medium bowl stir together the tomatoes, cucumbers, basil, red wine vinegar, olive oil, salt, and pepper. 2. 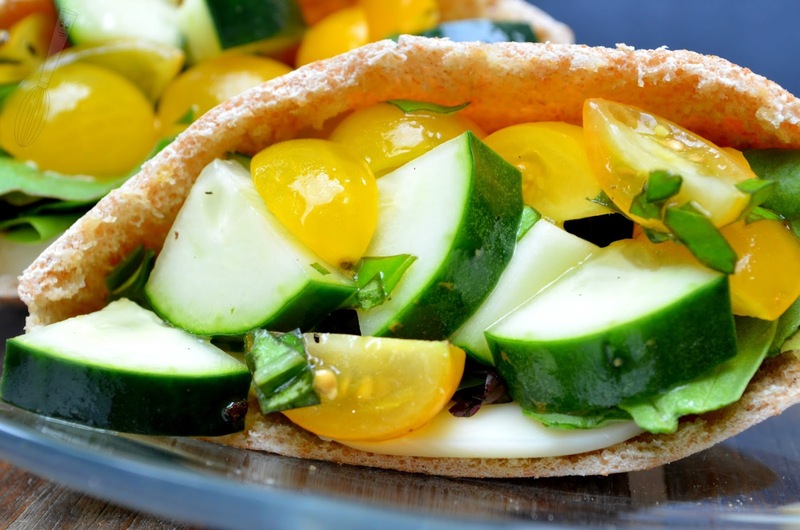 In each pita half, place one mozzarella cheese slice, then about 2 tablespoons of spring mix, then ⅙ of the tomato mixture. Repeat with remaining pita halves. Serve chilled.